Control and Dynamic Systems, Volume 59: Computer-Aided Design/Engineering (CAD/CAE) Techniques and Their Applications Part 2 of 2 is the second of a two-volume sequence that manifests the significance and the power of CAD/CAE techniques that are available and their further development for the essential role they play in the design of modern engineering systems. The volume contains 10 chapters and begins with an in-depth treatment of the essential integration that must exist between design and manufacturing systems. 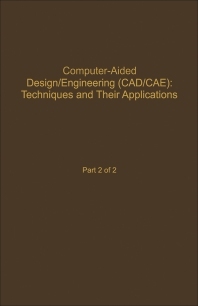 This is followed by separate chapters on object-oriented programming (OOP) and graphical user interface (GUI); technologies that support the CAD/CAE design process, in particular, by means of the PC and the workstation; and the role of a geometrically associative analysis modeler in the design optimization process. Subsequent chapters deal with finite analysis modeling for the integration of CAD/CAE technology and finite element method; the mechanical analysis of two large structures: the world's largest telescope the 8m ESO-VLT and a 3-D nuclear power plant heat exchanger; and techniques for CAD for electromagnetic systems and components. The final chapters cover aircraft structural design; techniques for determining the adequacy of the number of grids (i.e., grid quality control) in computational fluid dynamics (CFD); and techniques or the optimum design of control systems using system model variables and parameters. The contributions to this volume will provide a significant and, perhaps, unique reference source for students, research workers, practicing engineers, and others on the international scene for many years.